The following uses for platinum are gathered from a number of sources as well as from anecdotal comments. I would be delighted to receive corrections as well as additional referenced uses. Platinum is an expensive metal, even more so than gold, and this does limit its use. It was described as a precious metal as early as 1751 by Theophil Scheffer. It was used for jewellery as long ago as 1200 BC in Egyptian tombs. 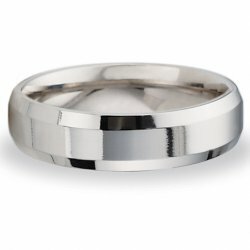 A platinum wedding ring supplied by Superior Wedding Rings.